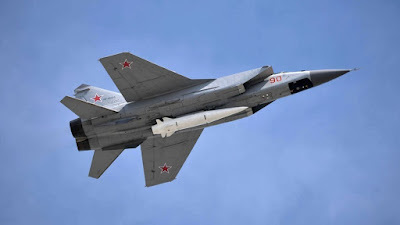 “The hypersonic air-deployed Kinzhal system – the missile which can travel at 10 Mach speed – is already used by our troops in the South Federal District,” Putin said. Two other novelties – the hypersonic Avangard system and Sarmat ICBM – will be put into service in 2019 and 2020 respectively. The Avangard hypersonic glider system, which can exceed the speed of sound 20 times during final approach, has been already put into serial production, the president revealed. “I don’t think that any other country will develop such weapon . Naturally, it will emerge at some point, but, as I’ve said already, it won’t bother us, since we already have it,” he said. But the Russian military has more aces up their sleeve, the president hinted, promising cutting-edge weaponry to be unveiled “soon,” without giving any details. “That’s not all that we are planning to produce and adopt,” Putin said. The counter-terrorism campaign in Syria provided a large boost to weapon development, he said, as engineers were deployed alongside Russian troops to test and fine tune modern weapons in the field. Russia’s involvement in Syria, however, is primarily a campaign to fight terrorism, and those who died in the line of duty will be always remembered, the president stressed. Nevertheless “it [the Syrian campaign] helped to fine tune the modern weaponry, namely the high-precision missile systems.